Heretic was a Japanese group that released two albums in the 80s. This CD combines these two albums and includes a bonus track recorded live in the studio. 1984-88 is interesting in that you can hear how Heretic’s music evolved over the four year period. The first three tracks are excerpts from "Interface Part 1," "Interface Part 2," and "El Rayo de Luna." The music is quite melodic with a progressive rock flavor. The fiery guitar work is outstanding and reminds me of Mike Oldfield. There are also moments during these first three songs when the music almost slips into New Age but it retains an edge. "El Rayo de Luna" has a particularly cinematic feel, almost a spaghetti western, and reminded me somewhat of Popol Vuh’s movie soundtracks. 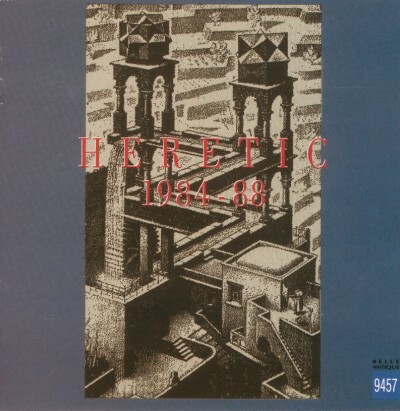 Following these we skip ahead in time to Heretic’s second album (1988). "Do Heretic" is 22 minutes of Heretic’s new musical direction. The music has a darker feel and slowly builds to a Heldon-like climax. The music is not as harsh or frantic as Heldon, more like a kinder and gentler Peter Frohmader. The next song is "Fail Safe Error." Something has seriously gone wrong. U. S. planes are about to attack Moscow due to a glitch in the system and the pilots won’t respond to the President! This movie soundtrack weaves in and out of suspenseful music, a fast bass groove, and some caterwauling violins. This is another excellent song sure to please fans of King Crimson and Heldon. Then the band shifts gears on us again with "Anonymous," a beautiful quiet acoustic guitar ballad sung in Japanese that reminded me of Neuronium’s "Abismos de terciopelo" from Vuelo Quimico. Once more Heretic changes directions with "Tripping on Waves," a jazzy tune with many strange and interesting sounds and noises popping in and out all over the spectrum. The last song from their second album is "m*a*f*o*r*o*b*a," an airy little bit of floating electronics. The CD closes with another King Crimson/Heldon influenced tour de force, "Resource." Here we have nine minutes of searing guitars, bass, and drum recalling Larks’ Tongue in Aspic and Red and including the talent of Chihiro S. (AKA Lacrymosa) on electric bass. 1984-88 is one fine release that displays the talents of a fine band that no longer exists. If you are a fan of any of the above named groups be sure to seek this one out. Active in Kyoto from 1984 until about 1989, Heretic was a trio which consisted of Hirofumi Kawahara, Toru Ohta, and Suguru Mori, performing on synths, guitar, and cello. For this CD release Belle Antique has put together a collection of tracks from the two LPs Escape Sequence and Interface. I'm not sure whether or not this does justice to Heretic's music since I haven't heard the complete original recordings. What we end up with on 1984-88 are four pairs of songs that resemble each other. The simultaneously warm and spacey "Excerpts from Interface Part 1" and " Part 2" aspire to Mike Oldfield proportions. But the arrangements seem almost like demos, because the drum machine can't prove the proper foil for Ohta's emotive guitar work. Then there is the manic, 90-mph epic tour-de-force "Do Heretick" and its companion, "Fail Safe Error." The former begins with a rich evocative drone and sparse percussion. The effect is splendid. About seven minutes into it, the atmosphere is transformed into a rampaging cybernetic free-for-all. Not to complain, but I was quite happy with the blissful opening section the way it was. In contrast are the slowly drifting landscapes of "El Rayo de Luna" and "m.a.f.o.r.o.b.a". Cello and soft female voice sneak in ever so subtly on these endangered species. These are my two favorite moments on the entire CD. Finally there are two group songs, featuring guests from Lacrymosa and Ain Soph. One is an open-ended jam, on which Ohta lets it fly with a Pinhas-inspired solo. Very nicely done! The other comes across somewhat like an electronic version of an 80s Crimson piece. So, all in all, a mixed set of compositions from Heretic, which should motivate more than a few people to search out their two rare LP releases. Heretic was a Japanese synthesizer / guitar based band from the mid-80s; this release collects three tracks from their first album Interface (1985) when they were essentially a three-piece (two synthesizers, guitar + violin) with sequenced percussion, their entire second album Escape Sequence (1988) featuring a five piece lineup (percussion, synth-bass, and cello, synth added to original lineup) and several guests including guitarist Yozox Yamamoto and drummer Taiqui Tomiiye of Ain Soph, and one live track from 1988. The three early tracks tend to be pastoral and melodically colorful, with guitar adding some solo work to a thick synthesizer base. The synth-drums are used sparingly, and in the context of the music sound quite appropriate, as they might on an album by Vangelis, Neuronium, or Jarre. On the second album they take a more bold and aggressive stance, balancing sonic experimentalism with a powerful Heldon-like energy. The 22 minute "Do Heretick" covers a lot of ground, and is by far the most experimental piece on the disc. By the same token, "Fail Safe Error" is certainly the most energetic and urgent, its pulsating rhythms and screaming contorted guitars could be straight from Heldon's Standby or King Crimson's Starless and Bible Black, it even lifts a few lines of dialog from the Henry Fonda movie of the same title. "Anonymous" is a shorter track, the only one here that features lyrics; "Tripping on Waves" is a jazzier sounding piece with some flashy guitar-work, and Yozox' only writing contribution to the album; ethereal vocals by Minako Urasawa are the highlight of the all-too-short "m-a-f-o-r-o-b-a.” The live track is the nine-minute "Resource,” a very Crimsonesque workout — the dual percussion will remind of Bruford and Muir on Larks' Tongues, and the wandering Frippisms of the solo guitar offer further evidence of influence — and interestingly enough, there's hardly any synth to be heard here, very different from what the band was doing just a few years before. This 76 minute disc covers a lot of territory, but it's a journey that most should enjoy!